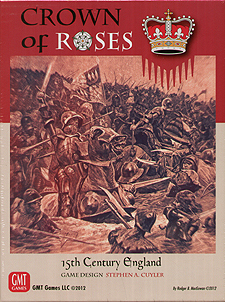 Harkening back to the days of Avalon Hill's Kingmaker, Crown of Roses recreates the chaos and uncertainty that marked the Wars of the Roses; a bitter struggle that set brother against brother, father against son, saw captured prisoners executed without trial, and battles won and lost by treachery as well as force of arms. It would forever change the political landscape of England; and mark the end of the Middle Ages and the beginning of England's rise to prominence on the world stage. The House of Lancaster - Led by the inept Henry VI and his implacable Queen Margaret of Anjou. Can they hold on to their Kingdom? The House of York - The Duke of York and his sons have a better claim to the throne than Lancaster. Can they take what they believe is rightfully theirs? The House of Buckingham - The experienced Duke Humphrey and his grandson Henry are legitimate claimants to the throne. Can they usurp their cousins? The House of Warwick - Led by the Earl of Salisbury and his son the Kingmaker, they are the most influential people in England. Can they engender a new English dynasty? Operations Cards generate OPS Points and game events such as peasant uprising, foreign raids, and even the dreaded plague. Embassy cards summon the King to various Shire for meetings with foreign ambassadors; Ally cards wait patiently, ready to lend a hand in battle - or in the halls of Parliament; and lurking somewhere in the deck are Vacillating Nobles and dangerous Treachery cards. Players wield their OPS Points to secretly sway nobles to their cause and to move their forces around the nation to bring the usurpers to battle. Bid too little on a noble and you may find yourself without support in Parliament - or on the field of battle. Blocks allow for a limited fog of war aspect that will keep the opposing armies in the dark as to a player's true strength. And each noble may have different qualities of troops available, represented by the use of different coloured dice in combat, each with its own hit chance. In Parliament, players might gain new supporters and/or retain old ones, using their combined voting power to try and establish their own house on the throne; and later to secure important political posts for their faction. And when Parliament concludes, the nobles disperse to home estates, which may disrupt plans or create new ones. They say it's good to be the King- will that be you? As a long-time devotee of all things pertaining to Richard III, this had to be a must- buy for me. Crown of Roses weighs in with a substantial heft factor. A deep box reveals a rich package: part block game with features familar from Columbia's Richard III, part CDG, part attempt to create a Kingmaker for the C21st. This latest attempt to cover the Wars of The Roses tries to embrace all aspects. The large, substantial card-stock map is elegant and clear, the blocks and their labels equally attractive and the cards that drive the machine richly designed. Alas the blurb for the game "using intuitive mechanics" is perhaps a little disingenuous. The rules are substantial, at times innovative, particularly the sequence of movement into enemy areas and its effect on combat order. However, they are complex and incorporate many minor individual provisos - consequently there is a steep learning curve to be encountered. Without doubt, the four player game of Crown of Roses represents the best value, but be prepared for a very lengthy period explaining the rules to those new to the game and the need for one of you to be very familiar with those rules. Ottherwise you will become mired in doubts and uncertainties and the game will slow to a crawl. An immense labour of love, which might just have benefited from a more dispassionate developer pruning the thorny plant!